After the incredible Zoolook, Jean Michel Jarre makes a step behind to return to his analog style recorded and played on digital equipment. If at that time the effect was of ox, the fact remains that Rendez-Vous didn’t aged that well. A little bit as we can cheat with the analog sound! Rendez-Vous is a very short album, hardly 35 minutes, where ambient atmospheres circulate on rhythms animated by evocative and historic voices samplings and orchestral arrangements which confused more than one. Vaporous pulsations initiate the breaths of the "First Rendez-Vous". Notes float with a discreet harmony on an atonic movement. Synth strata crisscross mellotron pads, oscillating and rocking in an icy oblivion with all the placid serenity of a somber cosmos. This "First Rendez-Vous" is a setup to introduce the epic title of Rendez-Vous, "Second Rendez-Vous" where synths with acute and rotary sirens shake this cold sea of spatial tranquillity. A 2nd identical line takes shape and competes to this rich bicephalous movement which progresses with heaviness on good orchestral arrangements and intense juvenile choirs, adding an austere dimension to a nevertheless explosive music. At the antipodes of his art, Jarre makes spin his synths among analog sound effects which decorated the cosmic atmospheres of his 3 first albums and through furious solos, musical corridors to odd-numbered identities and his famous harp laser which confronts the outdated of violins’ strings. This is quite a moment that marks the story of contemporary and classical EM and this under the plume of Jarre. At about the 8th minute the movement pulsates with buzzing reverberations, nodding on the sequence which initiated the fury of this "Second Rendez-Vous". This title is pure dynamite and another classic to be added into JMJ musical box. "Third Rendez-Vous" marks the isolation of the laser harp of which the slow keys sigh beside cosmic choirs and percussions to metallic rustles which get lost in the resonances of a deep dark sea. Short and floating it precedes the electronic anthem of this summer, "Fourth Rendez-Vous". Distant sound effects with tones of belching locusts get closer on percussions to fine tones of rattlers. Their bangings of steel support a rhythm slightly pulsating, guiding this catchy rhythmic structure of "Fourth Rendez-Vous" through a swarm of synths of which the candid refrain rolls in loops in our souvenirs. It’s good. Oh yes it’s good and lively! Like it or not, "Fourth Rendez-Vous" marked the world market with this incestuous mixture of candy pink rhythms and tunes, tinted by a surprising percussions play and by superb sound effects. It’s a title which we don’t count anymore the remixes, mixes and reprises and which is among Jarre’s biggest classics, in the same way as Oxygene IV is. 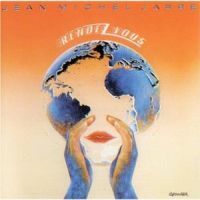 "Fifth Rendez-Vous" is a strange carousel of eclectic tones where neurotic choirs and half complete hymns swirl in a beautiful collage and sampling coming from one of the first works of Jarre, Music for Supermarket. It’s as much attractive as beautiful and it shows all of the ingenuity of the French synthesist to shape split up melodies and rhythms in structures which seem a bit improvised. "Last Rendez-Vous" is a title which had to mark the history and which marked it but of a quite other way. Dedicated to the astronaut Ronald McNair, it had to be the first musical piece to be recorded between space and earth. Inconveniently the Challenger shuttle exploded soon after its launch, postponing indefinitely this ambition musical and artistic project. It’s a nice and touching track, filled by a soft and bitter melancholy of which the soft rhythm pulsates on the beatings of life and a pleasant saxophone blowing a beautiful melody enfolded by a synth to introverted layers. The problem of Rendez-Vous is that it was realized after Zoolook. The contrast is striking and the regression evident. It’s not bad as such; it’s just a question of timing. Cause after Zoolook, Rendez-Vous seems anaemic and atonal while it’s quite not the case. It’s a good album which wasn’t able, unfortunately, to resist against the weight of ages. And it’s a pity because it’s the big forgotten of Jean Michel Jarre's career!